Firstly, I wish my camera could do this color more justice. Secondly, I'm staring at my hand right now and my nails are dark, and right next to me is the Electric Grape bottle and the polish in there looks like it could almost be neon. I'm gonna be totally bright, I swear! Electric Grape is, realistically, a fairly opaque eggplant shade loaded with micro glitter; lots of bright pinky-purple and a little blue. Slightly Static Plum. Zoya Anchor base coat. This was pretty opaque with the first coat and as soon as I applied it to the nail it looked like it does in the bottle, but twelve seconds later it darkened. Added another coat to even things up completely. 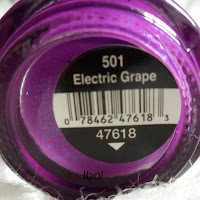 The Seche Vite top coat seemed to lighten the polish up but again it went right back to eggplant once it dried. Tried to get the sun involved, here. I mean, I think I prefer the color it ends up being anyway. I feel like a more neon shade would be less wearable for me. The polish really is quite a few shades darker in person. From far away, also, the glitter is super subtle but it still adds, you know, that somethin' special. More than a straight shimmer would, IMO. And that's more or less what it actually looks like. But I really am as pale as all the other pictures make me look. OH MY GOD MY BLOG CAME UP ON GOOGLE FINALLY! I needs some of these Salon Perfects in my lifee!